For the most recent Product Anonymous meetup on the 20th March, Liz Blink and Jen Leibhart invited us to come and talk to product managers about UX. – Fox Woods, a UX and web consultant who works with startups and agencies on various types of projects – from analysing product ideas before they’ve even become a MVP, to crafting the information architecture and user experience for iconic Australian websites. – Matthew Magain, the co-founder of UX Mastery, a website chock-full of resources for UXers and people interested in learning more about UX, including the UX Mastery community forums and a range of ebooks. Matthew also creates whiteboard animations and illustrated videos for companies that have complicated ideas that they need to communicate in a simple (and interesting!) way. We both attended a Product Anon session before we finalised our plan, so that we could suss out what to talk about. It seemed like many product managers are already heavily involved in User Experience (UX) areas of work – whether from working with their UX teams or UX experts, or because that work sometimes defaults to them, or because they choose to champion good user experience in their teams, as no one else is looking after it. We decided to do a workshop (activities are much more interesting than passive listening!) 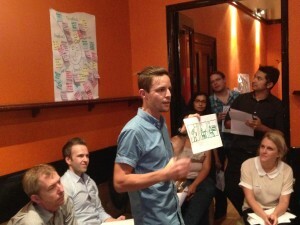 rather than a talk, and we based the workshop on Jared Spool’s theory of The Five Indispensable Skills for UX Mastery. We handed out a one-pager to everyone, and began by going through some descriptions and examples of the 5 skills. Sketching is a fantastic way to facilitate idea generation and communication. Having a whiteboard nearby – at all times! 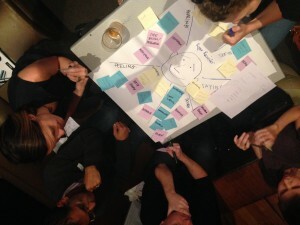 – for sketching out thoughts, sketching ideas with others, brainstorming… can be invaluable. The brain is able to loosen up and think in different ways when you’re playing with something that’s just “rough work,” unlike when you’re dealing with rigid letters, numbers, diagrams, boxes, lines. We don’t mind making mistakes when we’re in sketch mode, and sometimes great ideas can come from strange mistakes! From talking with the product managers at Product Anon, it seemed like this is a skill that could be nurtured more in product teams. We all have to critique ideas, designs, products and much more in our work, but we do want to remember that critiquing is a skill that can be improved. Skilled critiquing often goes hand-in-hand with skilled communicating: sandwich a criticism in between two positive comments; always use constructive criticism; be objective in your critiquing; always note down assumptions that people are making, so that you can test them later; and tie reasons for your criticisms back to your UX research: your users, their needs, and their empathy map. We had made a guess that storytelling didn’t play a large part in the product manager’s role, but we were wrong! From listening to our attendees, we learned that most product managers find that they’re often using storytelling techniques – especially to communicate stories about their users to their development teams. There are many different ways to tell stories to aid communication and understanding, and we had an example activity at the workshop: Communication Comic (details below). Like critiquing, we all need to do a lot of presenting in our roles. This is a skill we can always work on – and some of these other skills (like storytelling, and sketching) can lift our game enormously. Like many of these soft skills, learning how to deliver a killer presentation is a lifelong skill that is useful in all aspects of business, beyond the worlds of Product Management and User Experience. Lastly, facilitating. As we mentioned above, having a whiteboard culture (whiteboard nearby, at all times!) can really help with the facilitation of meetings – to get people on the same page, to increase understanding, to capture different thoughts and perspectives, and to plan quickly. There are many other functions where we perform a facilitating role – workshops, brainstorms, gathering stakeholder or user feedback and surveys, etc. Facilitating is a skill we can always improve, and as with presenting, storytelling and sketching are two skills that can help with this one. Next, we asked for four volunteers to share their experience as a product manager, the type of product they’re working on, and the role that UX plays within the project. (Aside: We specifically asked for two men and two women to volunteer, so that women would be more encouraged to participate – in retrospect, we should have had some affirmative action for introverts to be encouraged more to participate, as well!) Four people kindly shared their experiences, and we then broke off into groups of four for the first activity. We then encouraged everyone in each group to take a marker and some Post-It notes, and to add notes on behalf of the user. We suggested a minimum of 5 notes per empathy area. For the Communication Comic, we gave everyone pens and A4 paper, and asked them to draw three boxes. Then, using the tips from the one-pager – creating box-figures instead of stick figures, and changing the shape of the box to indicate movement and perspective; looking at ways of doing simple facial expressions simply by adjusting the eyebrow and mouth shapes – we asked everyone to pretend that they were communicating the need for a new product feature to their development team, and needed to draw the user’s story in a 3-panel comic. We weren’t sure how people would take to this activity – so many people are told (or think) that they “can’t draw” and it inhibits them from trying visual communication – but it was fantastic! 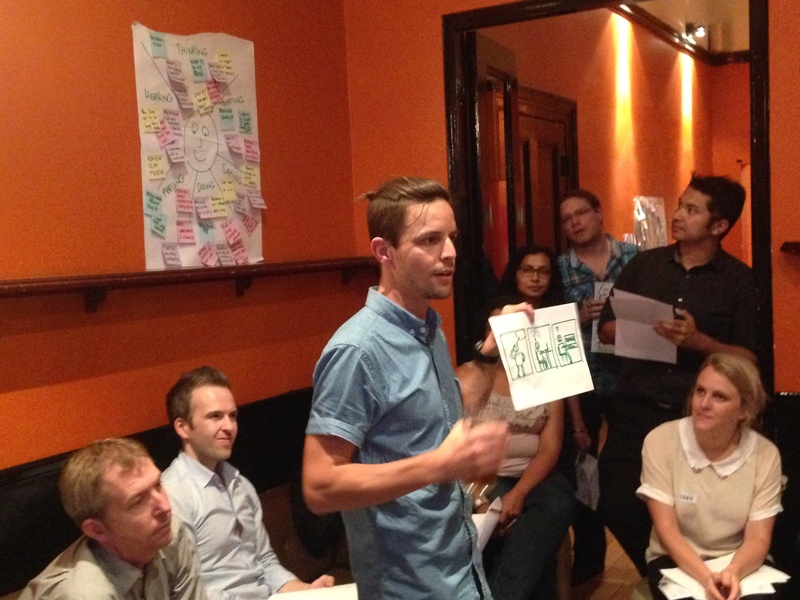 Everyone had a go, and the comics each told a user story about the product. The night was a massive success, and we would like to thank Liz and Jen for inviting us to speak, and to everyone attending for being such good sports about sharing their rough work – we had a really good time and hope we can do another workshop one day! The UX Mastery team are teaching an Introduction to User Experience workshop on April 24th, at Nest Coworking in Thornbury. Tickets are just $60 per person. This entry was posted in events by fox woods. Bookmark the permalink.